Rye is a town in East Sussex. Trains run directly from Ashford International and Brighton with trains to London calling at both stations. Times for trains anywhere to Rye from anywhere in the UK can be found on the National Rail website [www.nationalrail.co.uk]. There are buses from Hastings and Dover, the timetable can be found here . Rye can be easily explored on foot. However, it may be worth taking the bus to Camber to see the local sandy beach or finding a bicycle to go down Habour Road to explore the Harbor mouth and local bird reserve. The docks by the river; Rye Castle (with Ypres Tower). Rye also has a 12th century church, overlooking the town. The old town town centre is very picturesque with its extreme cobblestone roads (ensure you wear sensible shoes), its many timber-framed houses, and the occasional traditional -though now slightly touristy- tearoom invites to cream tea. There are many places which overlook the local scenery, from Rye Castle you can see out to Dungeoness. Recently wind turbines have been placed near to Rye, which has changed the nature of the landscape. Visit the Rye Heritage Centre, , an ideal introduction to the town bringing together the story of Rye set within the famous Rye Town Model sound and light show. Also offer walking tours and gifts typical to the region. Walk around the docks mentioned above, visit the many shops. Climb the church tower to get a magnificent view over Rye and its surroundings. Walk across the meadows to the ruins of Camber Castle (open on summer weekends; check with its owner, the English Heritage). Visit Ypres tower and have a chat with the elderly gentleman who has been keeping it open visitors for the last 15 years. Get locked in in one of its small, dark cells! Rye Castle Museum is located on two sites, on East Street and at the Ypres Castle. One of the tourist websites includes a picture tour of the town. Rye Art Gallery was established as a Trust in the early 1960s. Located at 107 High Street, it provides a focus for contemporary visual art, which it exhibits alongside heritage artworks from its permanent collection. Rye also stands at the centre of a network of nature reserves, some of national importance. The Rye Harbour lies to the south and includes the Rye Harbour Nature Reserve. The neighbouring Pett Levels and Pools, and the Pannel Valley nature reserve are accessible via Winchelsea and Winchelsea Beach a few miles to the west, whilst Scotney Lake lies just off the Lydd road and the RSPB reserve at Dungeness lies a few miles further to the east with the Bird Observatory located in the old lighthouse. 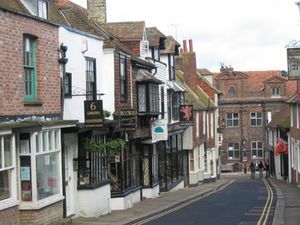 Rye has a wide variety of shops, from wool to antiques and from art galleries to tea rooms there is something for most people. There are also several shops which sell local Sussex produce. Most of the shops can be found on the main High Street, although there are also several pleasant shops near the docks. Rye has a lively market most Thursday mornings selling a variety of goods. There is a wide range of eatteries in and around Rye. Cinque Ports Inn The oldest pub in Rye. Traditional and friendly English pub where you can enjoy the best of Shepherd Neame's real ale, with good lagers and ciders, in a clean and comfortable setting. With restaurant and bed and breakfast accommodation. Globe Inn Freehouse pub and restaurant in Rye with music nights on Mondays. Harveys is one of the regular beers. Mermaid Inn 15th century, timbered, pub in the historic, cobbled street surroundings of Rye. Beers include Old Speckled Hen and Courage Best. Accommodation in wooden-beamed rooms with 4-poster beds. The Ship Inn 16th century inn situated amongst the old warehouses (now antique shops) alongside the river estuary in Rye. Cask beer served straight from the barrel. Provides accommodation. The Hope Anchor Watchbell St Rye, East Sussex TN31 7HA United Kingdomm +44 1797 222216, . The Hope Anchor is a mid 18th Century Hotel built at the end of one of the most delightful streets in Rye. The Place at the Beach New Lydd Road, Camber, TN31 7RB +44 1797 225057, Fax: +44 1797 227003, . Overlooking the dunes, the Place at the Beach is uniquely located a hop and a skip from one of the most dramatic white sandy beaches on the South Coast – Camber Sands. Rooms from €75. Visit some of the other Cinque Ports, or the Hythe and Dymchurch Miniature Railway. To the west Hastings, Eastborne and Brighton are reachable by direct train. Near Rye passes the National Cycle Network, and you can hire a pushbike from "Rye Hire" near the rail station (friendly service, bikes in good condition, and come with a lock). Sadly the designated cycle paths are not always well signposted, or consist of paths with quite large rubble; you will have to show some determination. But it's fairly flat ground around Rye (although town centre is on a small hill), so for the non-driver this is an alternative to buses. Ten minutes drive or bicycle from Rye is the beach town of Camber Sands  which has the longest sandy beaches on the south coast of England. It becomes very popular in the summer months when English people take to the beaches in search of sun. A tourist attraction is a place that tourists are attracted to. Many of the locations described on Wikitravel are tourist attractions.